Prior to this I decided to take a look at their website for research purposes. Immediately upon landing on their homepage, visitors are met with imagery intentionally designed to invoke the bucolic days and by-gone era of the “family farm”. This is an often used marketing strategy to assuage concerns consumers might have as it relates to animal welfare and environmental issues in animal agriculture. Maple Lodge Farm’s home page. In reality, Maple Lodge Farms (“MLF”) is one of the largest processing facilities in North America. It is, by all definitions, a “factory farm” facility. MLF slaughters approximately 500,000 birds a day - that is 182,000,000 chickens and egg-laying hens per year. Their products are sold across Canada and they are a leading processor of Halal chicken (which means the birds cannot be stunned before their throats are cut). MLF also promotes in virtually all of it’s advertising that their products are “Proudly Raised On Local Ontario Family Farms”. But is this true? No - at least not on the night I was there. Every truck that arrived between 6pm and 9pm came from Pennsylvania and Ohio. 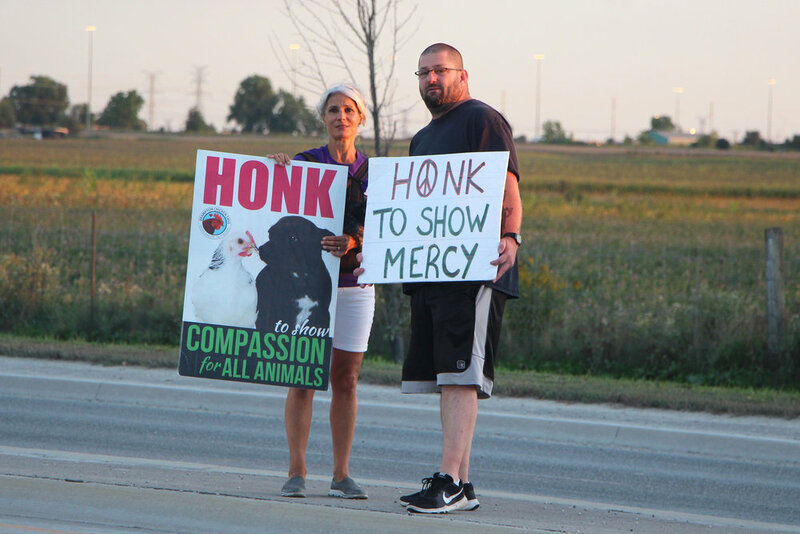 Members of Brampton Chicken Save, who attend these vigils weekly, have indicated they have also seen trucks routinely come from New York State, as well. 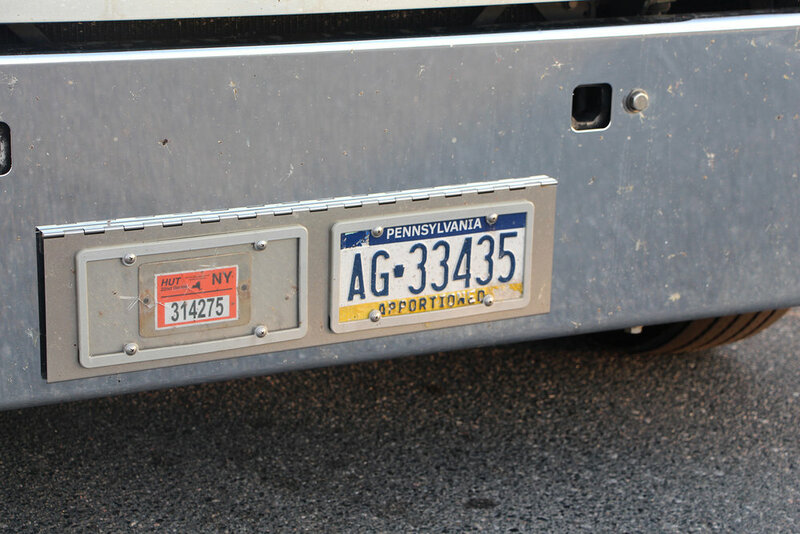 Above gallery: photos of truck license plates showing where the hens arrived from. So again, why are American hens coming to Canada for processing? It may simply be because the supply exceeds the demand for hens produced from the U.S. egg industry despite a percentage destined for school lunch programs. It would seem U.S. egg farms, who cannot find a local processor to take their birds, have two choices: either dispose of spent hens on-site when their laying cycle comes to an end and they are replaced by new layers, or sell them to a foreign market like Canada. The latter appears to be the case, at least from some farms that reside in border states like Ohio, Pennsylvania and New York where the cost of transport can be kept to a minimum. And this begs another question: What is MLF paying for these birds? Are they paying very little relative to what they would pay Canadian egg farmers? Or are they paying absolutely nothing beyond the cost of transport? This seems more plausible as it would benefit the farms that do not have to invest in maceration or gassing equipment to dispose of their hens. Some of these farms may also be prohibited from dumping or incinerating dead (or near-dead) hens on site due to environmental restrictions. These U.S. egg farms are probably glad MLF are taking them off their hands. And if this is true, then MLF’s margins are probably better than what they enjoy from spent hens arriving from Canadian farms. So how do the rules around the transport of egg-laying hens apply when these animals are transported across international borders? In Canada, the CFIA (Canadian Food Inspection Agency) stipulates poultry can be transported for no more than 36 hours without food or water. However, the clock doesn’t start ticking until the trucks cross the Canadian border. If a trip from the Windsor/Detroit or Buffalo/Ft. Erie border takes 3 or 4 hours they are well within the window. But, neither the CFIA, Maple Lodge Farms, nor any other Canadian authority have jurisdiction stateside. How long the hens are on a truck before they reach the Canadian border is anyone’s guess. So let’s look at what the distance and travel time is direct between a farm in Medina, Ohio to Maple Lodge Farms slaughter facility (see map below). Let’s also assume the truck loaded all the hens from only one farm in Ohio (so no other stops or pickups were made) and there were no delays at the border or as a result of traffic on either side. From Ohio it would take anywhere between 5 to 6 hours. Realistically you could add a one hour delay at the border and anywhere between 1 to 2 hours for traffic snarls and congestion (certainly on the Canadian side where the truck must travel all 400 series highways) as well as at least one pit stop for the driver (add 30 minutes). That equals anywhere between 7.5 to 8.5 hours and 310 miles or 500 kilometres. Map of route distance and time between Medina, OH and Brampton, Ontario. And what about Pennsylvania? It would appear to be closer to 8.5 to 9.5 hours with a distance of 370 miles or 600 kilometres. Both of these trips are within the window required by the CFIA. That said, both of these journeys would be further and longer than most trips hens would typically endure from farms located within the densely populated Southern Ontario region. Regardless, and as pointed out previously, this supply of American spent hens is not in keeping with MLF’s advertised pledge to Canadian consumers of “Proudly Raised On Ontario Family Farms”. It can easily be argued that what Canadians are entitled to and should receive, are assurances that the food they purchase and consume are done so according to the rules and regulations put in place by Canadian-taxpayer-funded agencies whose job is to ensure compliance. No matter how inadequate those rules might be at times. There is no way to ensure that compliance, as it relates to transport, is being adhered to regarding animals coming from the United States. 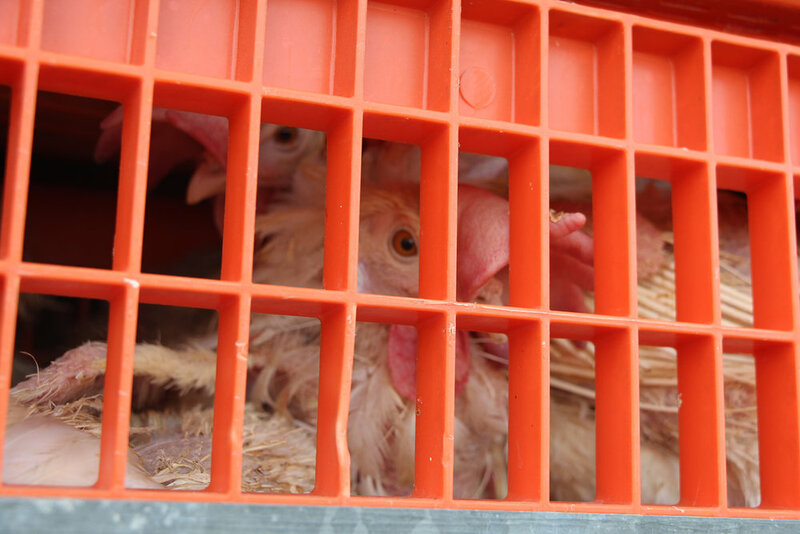 The CFIA has no jurisdiction over egg farms nor over transport companies in the United States. And likewise, the USDA has no jurisdiction over processors in Canada. It is a grey area that really needs some light shined on it. 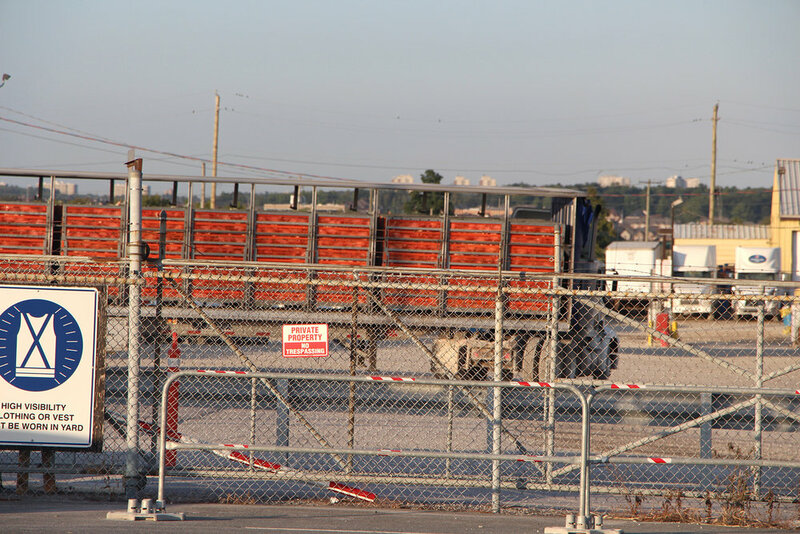 When the trucks arrived at the gate for MLF, and even before you can see the hens, the smell of urine and feces is pronounced. 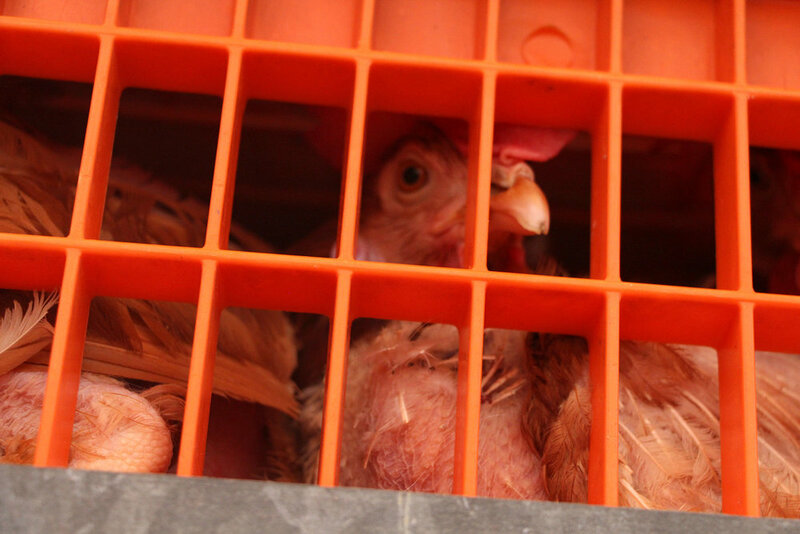 The hens arrive crammed into very low profile transport crates which are overcrowded. The birds are typically wide-eyed and alert which is understandable given their harrowing journey. Most suffer from extreme feather loss having been confined in tiny cages for up to two years. 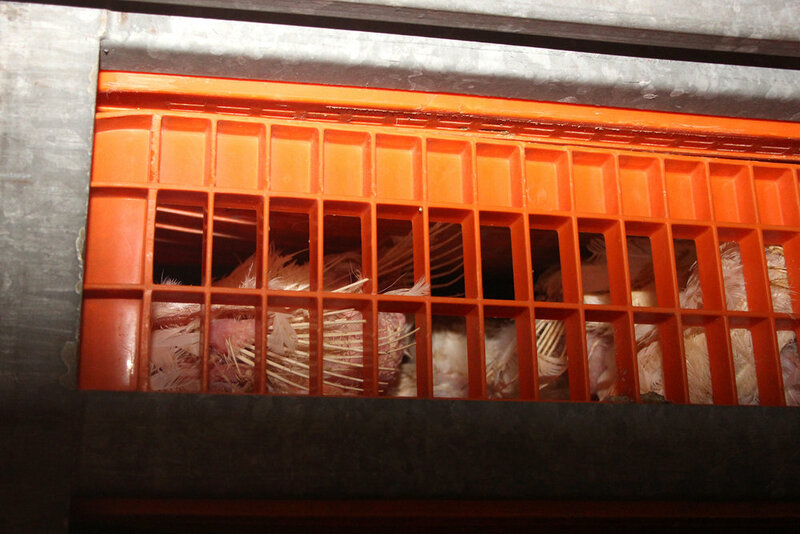 Some prolapses are visible on some of the birds and some open wounds can be seen - injuries likely due to rough handling when plucked from their battery cages and stuffed into the crates. Time is money and quick loading is the order of the day. I did not see any dead birds on arrival, however, in more extreme weather conditions (especially in the winter) D.O.A.’s are routine. There is a genuine sadness in my heart when I look at these poor creatures up close. My empathy takes over as I know what awaits them mere minutes away. Much of the world does not look at these poor birds like the beloved companion animals so many of us are familiar with. Nonetheless, I have yet to find or hear a morally consistent argument that can successfully rationalize that they are any different than our beloved dogs and cats. I feel a bit angry to be honest because I so desperately want to focus on them, to stare into their eyes deeply, to reach out and touch them and give them one brief moment of compassion. Yet, to get the photos I need to share with readers, I almost have to put that aside and concentrate on trying to focus the camera within the two minutes we are allowed to stop the trucks before they disappear behind the gates. I wish I had just a few more minutes. 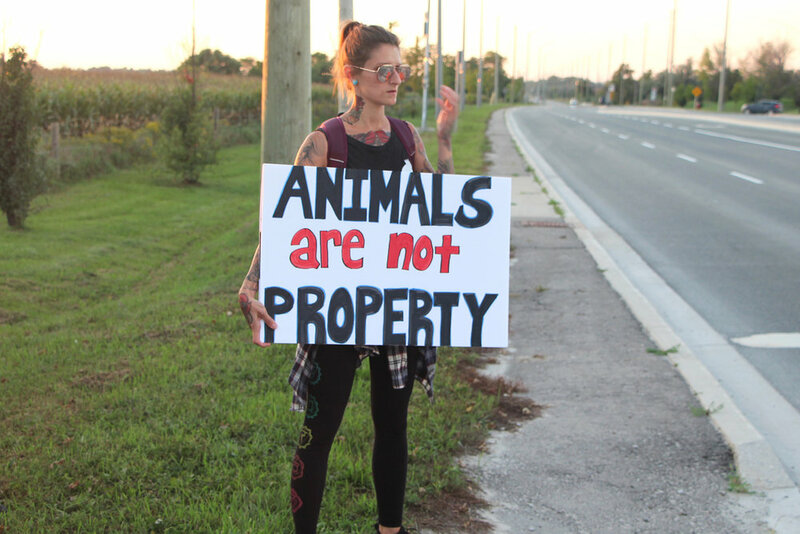 Below is a gallery of some of those photos, not just of the hens but of the facility and the compassionate group of people who continuously come out night after night to bear witness. However, the monetary penalties incurred by a company the size of MLF is hardly a deterrent. So much so, that less than one year later, Maple Lodge Farms was implicated in yet further animal cruelty (see video below) and while they were on probation from the previous convictions. It is important to note that spent hens processed in Canada are required to be put through CAS systems (Controlled Atmosphere Stunning) prior to being processed. This renders the birds senseless and/or unconscious prior to being hung upside down on shackles and sent down the line. The stunning requirement is mandated because a hen’s body is so exhausted, depleted of calcium and nutrients that their bones are exceedingly brittle and at risk of breaking if handled while conscious. And this in turn would inflict further pain and suffering for these birds. It also spares workers from experiencing the endless damage they would undoubtedly inflict on these poor creatures if they were live hung. There is no doubt that these matters as it relates to transport, duration and processing are all very complicated indeed. However, there is one way to make all of this simply disappear - going egg-free. If these animals are not selectively bred, if they are not confined, if they are not transported, and if they are not slaughtered, there is no issue. Each and everyone one of us can undo all the harm these industries inflict on these animals - just don’t buy their products. It truly is up to each and every one of us. There are so many egg-free, delicious alternatives out there. Any doubts about how animals are treated in our food system can be mitigated (or eliminated) by not eating them and/or their eggs or by-products. 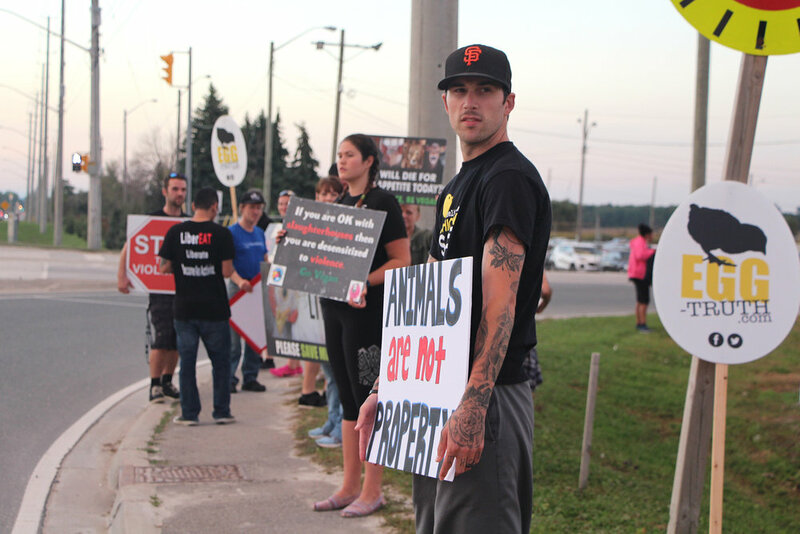 People like the folks from Brampton Chicken Save, are trying to help them. Will you join us? There is no doubt there is a Save Movement near you.